My view of Romania over the last 10 years is that it has been developing in a steady, predictable and incremental manner. The key policies of capitalism which were put into place almost immediately after the 1989 revolution – free elections/press/travel, rule of law, property rights – have been steadily strengthened. Every few years there were rumours in the media that Iliescu, Nastase or Basescu are about to become dictators, but each of these has proven to be a chimera; each one of these leaders has done a bit to consolidate this stability. Overall stability in Romania in terms of fundamental rights does not necessarily mean there is short term stability or clean politics. The political scene in Romania is characterised by a scandalous lack of morality, corruption, laziness (MPs only work a couple days a week), incoherence and random interference from the president’s office. The justice system is so dysfunctional, so clogged up with unresolved cases, that one wonders why it exists. Public sector contracts are so blatantly corrupt that Romania pays twice as much for its roads and railways as do normal countries and the worst thing is that most Romanians are so fatalistic that they just accept that this is the way things are and there is nothing they can do about it. Despite all this, the country functions. Just look around you. The snow is being cleared, the banks work, everyone seems to have a job, people travel continually and we have gas, water, electricity and a public transport system. Short term chaos within a solid and predictable macroeconomic system sounds paradoxical but is perfectly coherent. The elements of stability – rights, economic policy, membership of international organisations – are not very interesting subjects to discuss over coffee, not very good material for an increasingly sensational media. It is the nature of the media to focus on scandal, corruption, rumour and theft (remember the saying “good news is no news”) and people tend to believe that the chaos, crime and corruption they see on their TV screens says everything about their country. I spoke with Ilie Serbanescu, an influential Romanian economist, recently and he told me “Romania has no manufacturing industry”. We pointed out that industry represents 20% of the Romanian economy while in UK it only accounts for 12%. He dismissed this observation and said “industry has been destroyed or sold to foreigners”. This view of Romania – that capitalism has swept through the country like an army of marauding Mongols, leaving a devastated wasteland where only wolves and beggars survive – fits neatly with the Orthodox concept that we are just helpless sinners who are destined to struggle in the dirt and are powerless against fate. This idea of chaos fitting neatly with stability reminds me of the Ukranian writer Mikhail Bulgakov, who briefly ran the Moscow Arts Theatre in the 1930s and was one of the most brilliant Soviet-era writers. In Black Snow, Bulgakov writes of the apocalyptical chaos that went on behind the scenes in a Moscow theatre, and yet that same theatre would somehow manage to put on great plays. In Down and Out in London and Paris, George Orwell describes the filth and mayhem in the kitchens of some of the best restaurants in Paris (Anthony Bourdain has the same message today in Kitchen Confidential). Anyone who has worked on a film (or in a kitchen), organised an event or published a book will know that this pattern of behind the scenes stress and hysteria is a natural bedfellow with a coherent (even brilliant) production. 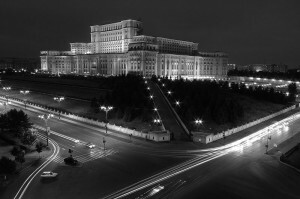 If we look at Romania over the last two decades we can see that each government has added something to this steady buildup of stabilising factors: Iliescu put the first building blocks in place by establishing the basic freedoms; Constantinescu put into place the key elements for economic and judicial reform; and Basescu has kept “the show on the road” in terms of EU integration. The fact that these presidents have contributed to this process of long term structural stability does not mean they are moral and honest leaders. Napoleon apparently said “if the king is a nice man the reign is a failure” and if there is one man in Romania’s recent past to whom this aphorism applies it is surely Adrian Nastase. Although he can be very charming, especially when speaking French or English, Nastase was the most feared and despised prime minister in the last ten years. He ran his government with a rod of iron, he terrorised his ministers, he dominated the media and allegedly made himself a fortune. Despite all his brutality and corruption he personally oversaw the passing of the key legislation that ensured Romania complied with the Acquis Communitaire (the EU’s “body of laws”) and got Romania into the EU. Even though he should probably go to jail for corrupt practices, Nastase deserves credit for running a disciplined government and getting into the EU – as this continues to set the political and economic agenda of modern day Romania.